With its sharp focus on contemporary life, recent history, and the very material of things, Tate Britain's triennial survey finds British art in rude health, writes Tom Morton. At the fag end of 2002, I found myself sitting in a scruffy room round the back of Tate Britain. I was watching something that looked a lot like a pop music promo (it wasn’t) and I couldn’t stop smiling. There was a Starbucks barista on the screen, her facial piercings hidden beneath a handful of blue plasters. She disappeared, and I was confronted with a couple of kids on a treadmill. Unaccountably, one of them was riding a microscooter. As the tape spooled on, I saw a jewelled tortoise straight out of J.K. Huysman’s A Rebours 1884, and somebody breakdancing in the street, their limber limbs smearing the copy of Botticelli’s Birth of Venus 1480 that had been chalked upon the pavement. This video – a brilliant mélange of the mundane, the magical, MTV and an almost Blakean mysticism – was Oliver Payne and Nick Relph’s Mixtape 2001 and features in the second Tate Triennial, an exhibition entitled Days like these. Curated by Jonathan Watkins and Judith Nesbitt, the exhibition takes its name from a film by Mike Marshall, one of the participating artists. 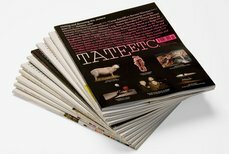 The second Tate Triennial isn’t about causing a sensation, it’s about British art now. On the strength of this show, it looks like it’s in good shape. They chose the title, Nesbitt said, because ‘it signals the contemporaniety of the show, without suggesting a ‘theme”. This themelessness is pretty alien to most bi-, tri-, quad- and quintennials (think of Documenta 11’s preoccupation with post-colonialism), but it allows Watkins and Nesbitt to stage a show led by art rather than a reductive curatorial argument. That said, there are some common threads that run through Days like these. At a time when sculpture’s star is in the ascendant, this Tate Triennial – perhaps surprisingly – features an abundance of paintings. There’s a George Shaw in the show, a doleful depiction of a council estate in Coventry, haunted by the ghost of hope. There’s a Gillian Carnegie, a picture of a bottom that probes the pitfalls of representation. There’s a Sarah Morris that meditates on the Modernist grid, accompanied – like her earlier series of canvases Midtown 1998, Las Vegas 2000 and Capital 2001 – by a film that focuses on an American metropolis. According to Nesbitt, ‘Painting is a subject that still absorbs artists, and is eliciting some pretty fabulous results.’ Looking at Peter Doig’s 100 Years Ago 2000, it’s hard to disagree. In the centre of the canvas there’s a guy in a canoe. With his long hair and his long beard, he looks like a hippy or a heavy metal fan. The canoe, a swoosh of orange pigment, is adrift on the ocean. Its occupant stares out at us, as though we’re somehow responsible for his predicament. The piece recalls Théodore Géricault’s Raft of the Medusa 1819, or more specifically the figure that squats in its foreground, his head wrapped in a red rag, his chin cupped in his hand. Both canvases are about abandonment – of shipwrecked sailors and the European Enlightenment, of acid casualties and the 1970s counter-culture. For all its dazed charm, Doig’s 100 Years Ago is a contemporary history painting. Perhaps that’s why it’s in the same show as the work of Dexter Dalwood. These pieces are driven more by the imagination than any documentary impulse… this is not ordinary, but a blast of the visionary implanted in the everyday. Although they explore contemporary concerns, Dalwood’s paintings are plugged into the past. Thematically, Ceausescu’s Execution 2002 riffs on Francisco de Goya’s The 3rd of May 1814 – his famous painting of French troops executing Spanish protesters. It also samples a passage from Georg Baselitz’s Der Krug (1989), transforming the German painter’s brushstrokes into bright red bloodstains. As with all Dalwood’s works, it tests the ties that bind art to its historical context. When I spoke to the artist, he told me that Ceausescu’s execution was broadcast – live from Bucharest – while Baselitz was working on Der Krug. Teutonic postwar painting and the Romanian dictator’s death feel like odd bedfellows, but by bringing them together, Dalwood gets us thinking about Europe’s darkest days and how Baselitz’s canvases confront the continent’s demons. Other artists in this show also engage with art history. David Batchelor’s illuminated tower – designed to scrape the Duveen Galleries’ ceiling – owes something to the late sculptor Donald Judd, while Cornelia Parker plans to wrap a mile of string around the smooching heads that crown Rodin’s The Kiss 1898. Nesbitt says this tendency is ‘always there, sometimes hidden, sometimes revealed’. In the centre of the canvas there’s a guy in a canoe. With his long hair and beard, he looks like a hippy or a heavy metal fan. The canoe, a swoosh of orange pigment, is adrift on the ocean. Its occupant stares out at us, as though we’re somehow responsible for his predicament. Days like these is also awash with colour, from Tim Head’s digitally projected pixels, to Jim Lambie’s sticky backed plastic ‘sculptures’, to a piece by Ian Davenport that will see him drip paint down the gallery’s walls. Nesbitt says of this riot of raw pigment, ‘maybe it’s related to an interest in the basic material of things’. Looking at the work of Head, Lambie and Davenport, it’s hard not to think of Frank Stella, an artist who once remarked that he wished the paint on his canvases ‘looked as good as it does in the can’. The second Tate Triennial isn’t about causing a sensation – it’s about British art now. On the strength of this show (which also includes work by David Cunningham, Ceal Floyer, Richard Hamilton, Susan Philpsz, Rachel Whiteread and Shizuka Yokomizo), it looks like it’s in good shape.